The combined effects of global warming and land-use change could cause the world’s ecosystems to lose more than a third of their animal species by 2070, a new study finds. Climate change is expected to become the largest driver of biodiversity loss by the second half of the century, the research finds, surpassing the effects of deforestation and agriculture. The local loss of species could greatly impair the ability of ecosystems to function as normal, the lead author tells Carbon Brief, which could, in turn, threaten natural services, such as pollination. However, restricting global warming to 2C above pre-industrial levels – which is the limit of the Paris Agreement – could reduce the risk facing the world’s ecosystems, the author adds. Rising temperatures and changing rainfall patterns are expected to make existing habitats inhospitable for many animal species. Biodiversity is also under threat from land-use change caused by agriculture, deforestation and land degradation. The new study, published in Proceedings of the Royal Society of London B, considers how both of these threats could combine to affect ecosystems across the world in the coming decades. The research finds that, in a future with relatively high amounts of global warming and land-use change, the number of animal species in the average ecosystem could fall by 38%, when compared to conditions from 1961-90. For his research, Newbold used modelling to produce a set of maps showing the expected impact of global warming and land-use change – and where these threats could overlap – in different parts of the world. His results were based on four possible future scenarios, known as the “Representative Concentration Pathways” (RCPs). Each scenario makes assumptions about a range of parameters, including the future rate of greenhouse gas release, the efforts made to combat climate change (mitigation) and the rate of global population growth. The maps below show where losses are expected to be “high” (greater than 10% of species lost) as a result of climate change (orange) and land-use change (blue) for each scenario. Areas where high losses from global warming and land-use change overlap are also shown (black), as well as where species loss is expected to be low (grey). The charts show that the combined impacts of climate change and land-use are expected to be highest under the “business-as-usual” scenario. In this scenario, land-use change is expected to cause biodiversity losses of 2%, while global warming is expected to cause losses of 29%. Biodiversity losses are expected to be particularly high in the tropical grasslands and savannahs of southern Africa and southern America. This is because these regions are the most likely to be converted to agricultural sites, possibly for the production of palm oil, Newbold says. 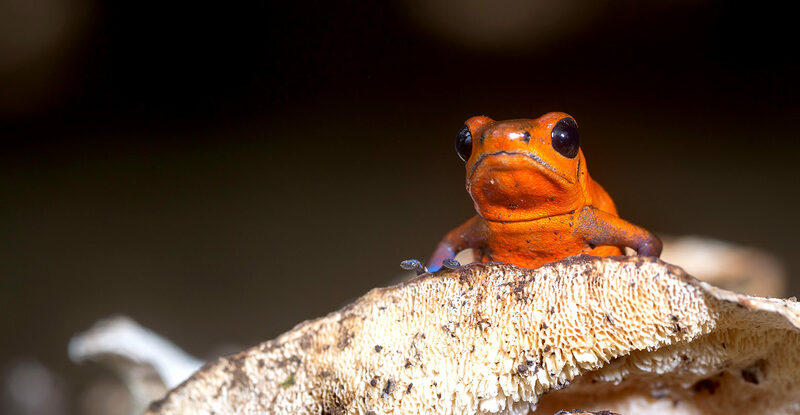 The analysis also suggests that amphibians and reptiles could be disproportionately affected by both global warming and land-use change, when compared to mammals and birds. Many amphibians have complex reproductive life cycles that rely on the availability of both land and freshwater. (For example, tadpoles are restricted to water while adult frogs live on land.) This reliance on multiple environments is likely to increase the group’s vulnerability to climate change. Reptiles could also be uniquely vulnerable to climate change. One reason for this is because reptiles rely on their external environment to regulate their body temperature, meaning they can overheat if temperatures are unusually high. The results show that the RCP2.6 scenario, which projects the smallest level of future climate change, leads to the second most negative land-use impacts on biodiversity. This is largely because the scenario relies on considerable use of bioenergy with carbon capture and storage (BECCS) to limit the effects of climate change. In theory, this process could reduce the amount of CO2 in the atmosphere – making BECCS a “negative emissions technology”. However, using large-scale BECCS to limit warming to 2C could require up to 18% of the land surface to be converted to biomass plantations – which could pose a significant threat to biodiversity. The new study, however, shows that when the impacts of global warming and land-use change are considered together, RCP2.6 still projects the lowest risks for biodiversity out of all of the scenarios. This suggests that the large land-use costs associated with BECCS may be offset by the resulting reduction in climate change impacts. Citi raksti kategorijā "Klimata pārmaiņas"